Ships today, 04-24-2019. We ship your parcel by Purolator Express®. Order in the next 3 hours, 57 minutes and 12 seconds for same day shipping. Upload an existing design. Make sure that the imprint size fits for respective stamp. Delivery is free for all purchases above $50. For orders of $50 and below a shipping charge of $10 is applied. Add to your order now! The MaxLight XL2-245 pre-inked stamp has a maximum text plate size of 1-1/4" x 3-3/16" allowing you to create up to 6 lines of customized text. This pre-inked stamp is perfect for creating business address stamps with logos, large message stamps, or any impression that requires the additional space. Keep your stamp clean, and your work area free of ink with the easy snap on dust cover. 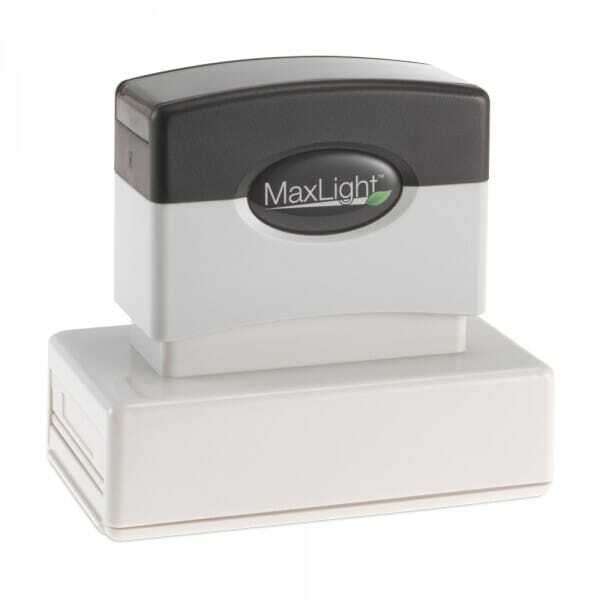 This MaxLight pre-inked stamp feature an indelible ink and offers thousands more impressions than a comparable self-inking stamp. Running low on ink? Adding ink is simple and clean and there is no pad to change out. Just remove the handle, add a few drops of ink and you're ready to go! MaxLight ink is available in black, blue, red, green or violet. Customer evaluation for "MaxLight XL2-245 1-1/4" x 3-3/16" - up to 6 lines"
Evaluations will be activated after verification. Trodat Printy 4911 - Stock Stamp - You did it! * All prices displayed are exclusive of Canadian sales taxes as marked. Final charges are displayed at the checkout page. Subscribe to the free getstamps.ca newsletter and ensure that you will no longer miss any of our getstamps.ca offers or news. © 2018 getstamps.ca Ltd.. All rights reserved.